Gratitude is defined by the Oxford English Dictionary as ‘the quality of being thankful; readiness to show appreciation for and to return kindness.’ However, many people are unaware of how expressing gratitude can change their lives for the better. If you are uncomfortable talking openly about your feelings there are lots of other ways you can express your gratitude, take your cue from some of our suggestions. 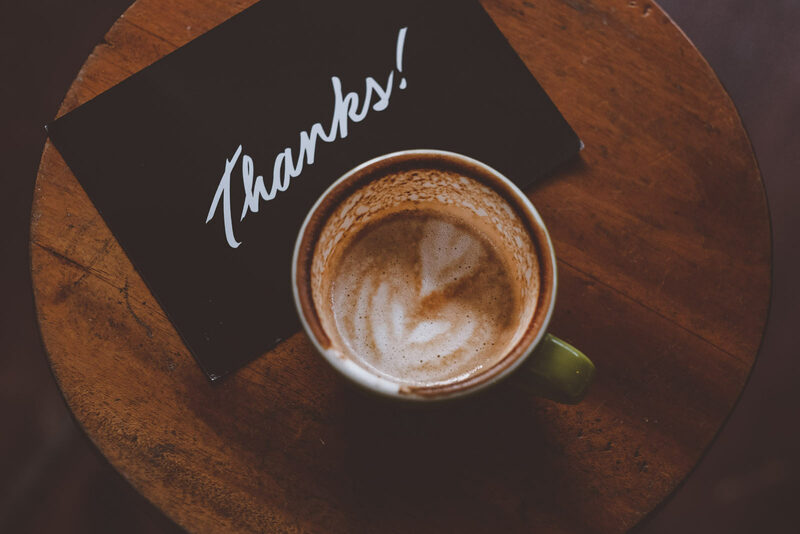 A simple ‘thank you’ card can mean a lot, but to really express your sentiment or offer encouragement, a handwritten letter is the best way to let a loved one know how grateful you are that they are in your life and that you are thinking of them. Giving your time is a wonderful way to show your gratitude. Spending quality time with friends and family, sharing meaningful experiences, is a great way to build relationships. It doesn’t have to be a big event, simply watching a film, or eating and cooking together can make a big difference, as well as obviously making yourself available during difficult times to offer your help, encouragement and support. You can show your gratitude to others by really listening to what they have to say without criticising or judging them. Find a quiet spot to sit together where you won’t be disturbed and remember to turn off your phone. Don’t interrupt them while they are speaking, don’t give advice unless you are asked for it, and don’t compare the person’s experiences to your own unless you really think it will help. Send a bouquet of flowers to let someone know you are thinking of them, bake a cake for a friend to say thank you, or handmake a personal keepsake that you know a family member will appreciate. Pay attention to what your friends and family say and find a way to show how much they mean to you by giving them a gift that shows thought and care. Don’t be afraid to be the one to say sorry after an argument or disagreement with someone you love and appreciate, even if you think you are in the right. Learning to compromise in relationships and in life in general is a hard lesson to learn but one that will reap countless benefits when you accept that you can’t always get what you want and become more grateful for what you already have. Connect with the people you love by hugging them to say thank you, when you meet them and when you say goodbye. Physical contact can make us feel more grateful, but if you think a hug would make them feel uncomfortable, a simple touch on the hand or shoulder, or a handshake is all that’s needed. Touch is the first sense we acquire, our first unspoken language, and it is the secret weapon in creating successful relationships. You can make someone’s day by simply smiling at them, whether it’s a stranger on the bus, as a way of saying thank you to the person serving you coffee, or to provide support and encouragement for a work colleague – smiling is contagious so do your bit to spread happiness and gratitude in the world. Show your gratitude and make your friends and family’s life easier by offering to help them out with day-to-day chores. You will be surprised how much difference it makes by simply walking the dog, feeding the cat, picking up the dry cleaning or offering to babysit. Favours like these are usually reciprocated and are a wonderful way to share the feelings of appreciation and gratitude you have with the people who are close to you.